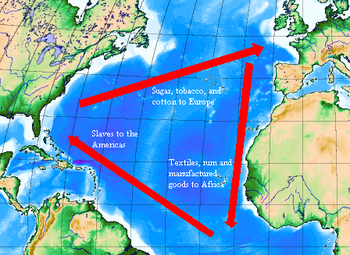 Illustration of the classical model of the triangular trade. The triangular trade refers to trade between three ports or regions. Triangular trade usually develops when a region is exporting resources that are not needed in the region from which its main imports come. Instead, the resources are exported to a third region. The routes involved were historically also shaped by the winds and currents during the age of sailing ships. The best-known triangular trading systems were across the Atlantic Ocean, especially the Atlantic slave trade, which lasted from the late 16th to early 19th centuries. During this time, European countries such as Britain, Spain and France had colonies in the Americas and Africa. The ships carrying slaves, crops and manufactured goods between West Africa, the Caribbean and American colonies and the colonial powers in Europe. The use of African slaves was very important to growing colonial cash crops, which were exported to Europe. European goods, in turn, were used to buy African slaves, which were then brought west from Africa to the Americas to work on the crops. The middle passage of the triangular trade refers to the transportation of the slaves to america. The Atlantic economy was tied into the idea of mercantilism, which thought it was a good idea for European countries to have a lot of colonies that traded only with them. Goods that were traded in the Atlantic economy were rum, slaves, sugar, tobacco, gold, spices, fish, lumber and manufactured goods. Wikimedia Commons has media related to Triangular trade. This page was last changed on 13 December 2018, at 17:02.